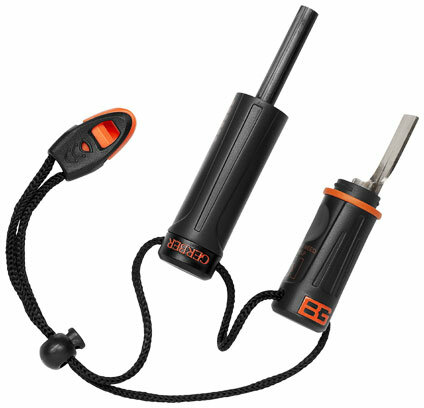 Ever since theBRIGADE’s first backpacking trip I’ve been on the lookout for an alternative fire starter that would be easy to carry and, more importantly, easy to use. Every backpacker knows there is more than one way to start a fire. My preferred method is by spark. Matches are too much of an annoyance and not nearly as satisfying. After doing a lot of research online I came across this product put out by Bear Grylls and Gerber. The Fire Starter. This ferrocerium rod and metal striker produce a super-hot, long-burning spark. I’ve used this striker on a number of occasions and it’s never taken more than two or three strikes to get a good spark going. (providing my tinder is dry enough) Of course, this isn’t going to work on anything wet. It’s always best to have some wet fire starter on hand just in case. I’ve been really pleased with this product. The water-tight storage compartment in the handle is enough to hold a wet fire starter or some dry tinder. I prefer to stuff mine with dryer lint. Cotton balls soaked in Vaseline also work amazingly. Be safe and enjoy. Next postUltralight Backpackin’ Tips by Mike Clelland!